The heavy duty scraping blade is as strong as ever, made from 1/4" thick polystyrene. You will love the promotional 10" Heavy Duty Ice Scraper as it has been redesigned with a sleek profile and dramatically larger imprint areas. 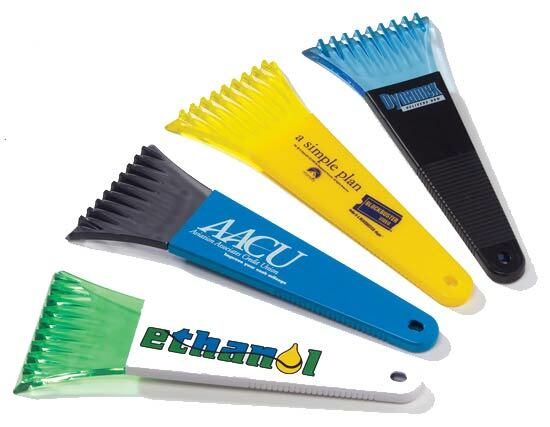 The sure-grip handle is available in 10 bright colors.Only Black handles are molded from recycled material. Bulk / 12 lbs lbs / 50 pcs pcs. / 15"(L) X 11"(W) X 6"(H)box. Imprint Area: 2 5/8" x 1 3/4" to 1 3/8"
Imprint Area: 5 1/2" x 1 3/4" to 1 3/8"